Then I made the mistake of mentioning to a few of my local friends that I was thinking of running it. A few were horrified, a couple were supportive but skeptical, but the majority were positively gleeful at the thought of having a new victim join their ranks. Friday night’s dinner was Chick-Fil-A, always a good pre-race choice. The boys and I hit Fleet Feet, where I bought a Nike jacket of some description because I was assured it would be warmer than what I had. I got about 7 hours of sleep and woke up to see that the outside temperature in my backyard was a balmy 23 degrees. I dressed accordingly: a merino wool base layer (top and bottom) from good old Costco, with CW-X tights and a pair of running shorts on the bottom and a local race tech shirt plus the Nike jacket. An old wool hat, a pair of Costco gloves, and my trusty ballistic sunglasses rounded out my kit. (Oh, and my ancient but much loved Fitletic belt, which I’d loaded with BASE Salt, lip balm, and snacks.) I drank a cup of coffee, ate 2/3 of a Tri-O-Plex protein bar, and headed to the Von Braun Center. I got there a good 45 minutes beforehand and had plenty of time to find a bathroom and say hello to various local folks who were running. My plan was to hold a steady 11-12:00/mi pace and to do a 3-minute run / 1-minute walk interval. I figured that would put me around 5:30 or so, depending on my walk pace. For nutrition, I’d brought a bunch of Bonk Breakers and Gu chews; I knew the course would have water and Powerade but wasn’t expecting any on-course nutrition. I figured that I wouldn’t need to eat a ton on the go, though. I was able to stay with the pace plan with no problem for the first 13, with occasional misfires when I didn’t hear my Garmin beep to tell me to switch intervals. Even without headphones, and even on quiet residential streets, it just isn’t loud enough to consistently get my attention. I was really worried that I’d go out too fast in the first few miles, as is my habit, but the combination of running with someone at the same pace and my nervousness about being able to finish the distance kept me in check. About mile 9, we caught up with the 5:00 pace group and stuck with them for a while. Along the way, I saw this delightful sign and couldn’t pass up the opportunity to capture it for posterity. WAKE UP SHEEPLE! At the halfway mark, the Panera Pounders, my local running tribe, had a spirit station set up, with everyone dressed up as Santa Claus. Seeing my friends was a terrific morale boost, especially because my neighbor-friends Erica and Rese had brought me an ice-cold bottle of Coke. Normally regular Coke is too sweet for me, but on long runs and bike rides I love the stuff. I drank the Coke, had some SportsLegs and Advil, ditched my jacket, hat, and gloves, pulled up my pants again, and headed out for the second half. It was a little weird realizing that every yard I ran past this point was contributing to a distance PR for me. However, I felt good and was sure that I’d be able to continue holding my target pace. Coaches hate this one weird trick! Not really; I learned this from a coach. One effective strategy for managing long endurance events is to break them up into chunks. Instead of saying “oh lord, I have a marathon to run,” you say “I have a half marathon, and then another one.” When you finish the first half, you say “oh, I only have 2 10Ks to run now,” and so on. This sounds stupid, but it’s a remarkably effective way to focus on what you need to be doing for the next little while instead of the immensity of the whole task. The back half of the race course is very different than the front half. 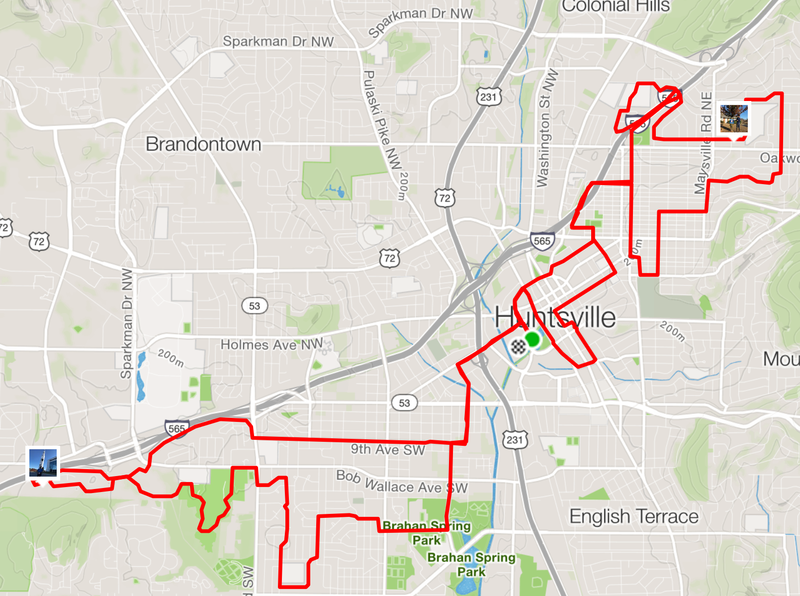 First, it’s arguably more scenic, since it runs through some projects, past Lowe Mill, then on to Huntsville Botanical Garden and the Space and Rocket Center, whereas the front half is mostly through residential areas. Second, to the extent that there are any hills, they’re on this part of the course. There’s about a 2.5mi stretch on 9th Avenue westbound that turns into a long-ish hill; it’s not very steep but there’s a lot of it. I was able to hold a decent pace through this section. It was motivating seeing the Saturn V off in the distance and watching it get closer, and closer, and closer, silhouetted against the stunning blue of the sky. 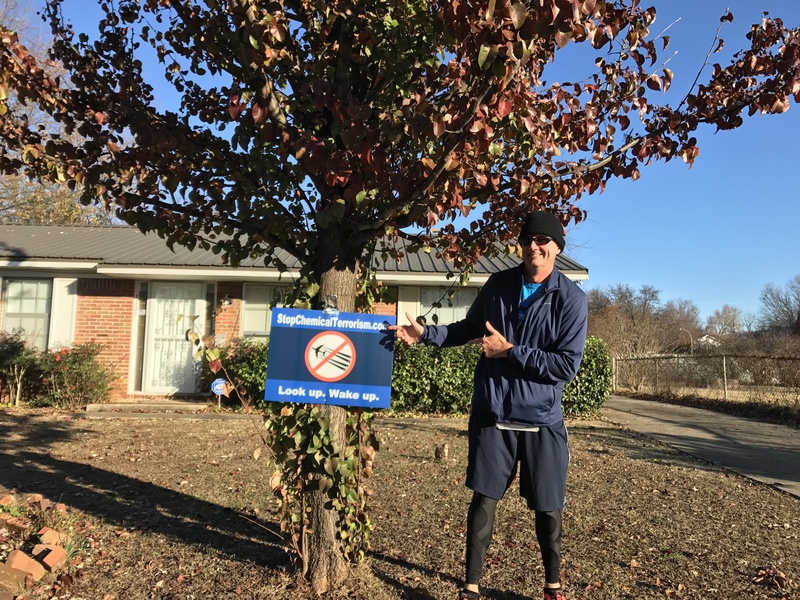 Mile 19 was even more motivating, as I ran through the SRC parking lot and back through the “Rocket Garden,” one of my favorite places to visit in Huntsville. Who doesn’t love a good rocket? It’s hard to say exactly where I became sure that I was going to finish the race. I’d guess it was somewhere around this portion of the course– I felt good, I was holding the pace I wanted, and barring an injury or mishap, I knew I’d be both physically and mentally able to cross the line. 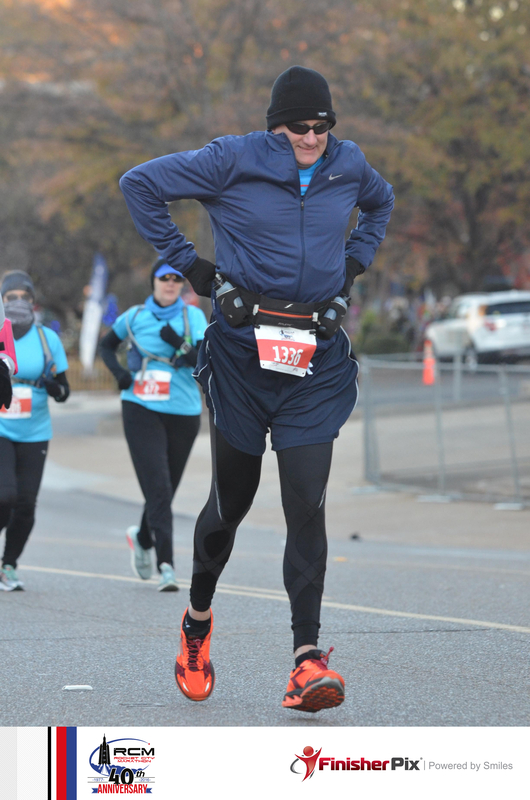 I spent a distressing amount of time hiking up my compression tights during this race. I was wearing them over a thin and smooth merino wool base layer, and the drawstring in the tights had come out of one eyelet so they weren’t really tied. As a result, the motion of my legs would pull the damn things down and every mile or so I’d have to hike them back up where they belonged. I’m sure glad the photographer caught me in the act. I thought I felt myself slowing down about mile 20, and the evidence bears that out– from mile 20 onwards, I only had two-sub-12:00 miles. 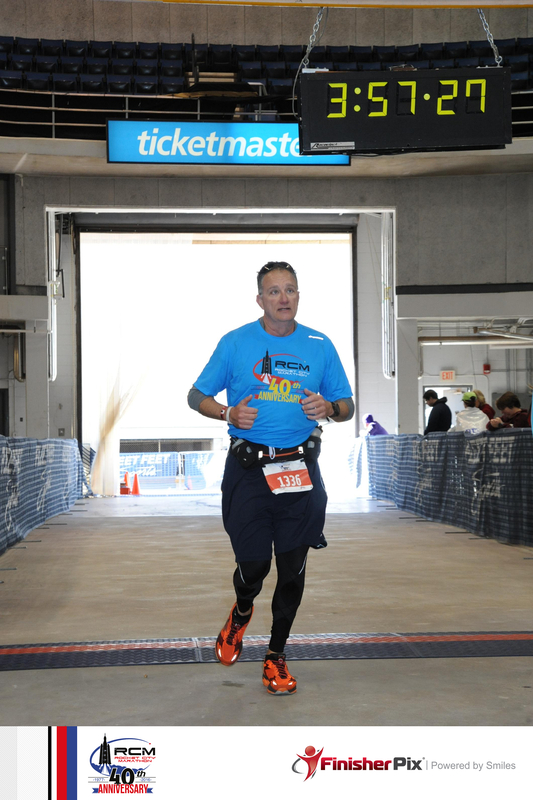 I wouldn’t say it was the famous wall we’ve all heard about– I wasn’t in any danger of falling out, just a progressive dragginess, coupled with increasing discomfort in my hip flexors and my left Achilles tendon. 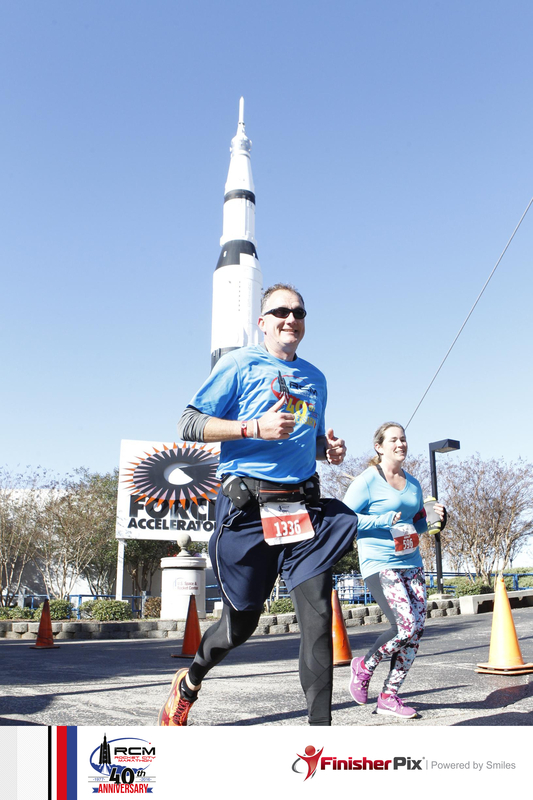 About mile 23, I also started feeling some pain in my right instep, just forward of my heel. I walked a good bit of miles 25 and 26; I didn’t think the few minutes I might gain by running through the pain would be worth the possible downside of a lingering injury. One thing I liked about the race course: they had mile flags every mile, with an extra “25.2” flag one mile from the finish line. 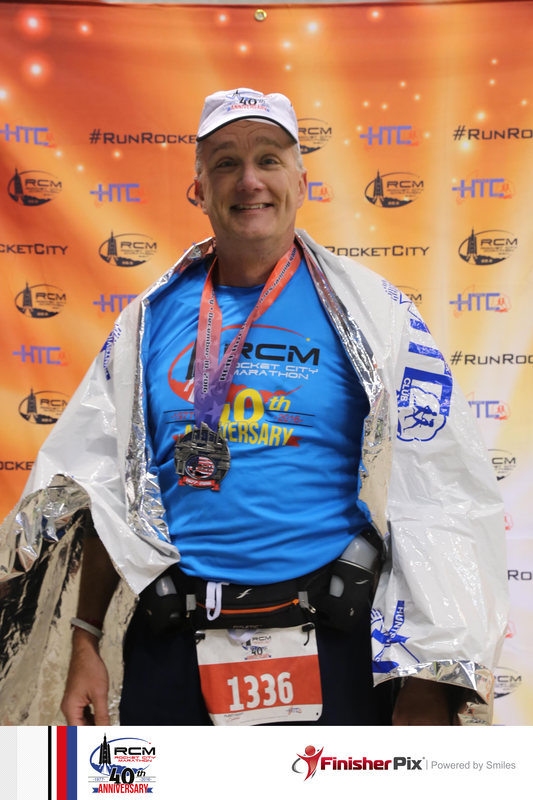 The RCM course has you run into the Von Braun Center and finish on the arena floor. This is a neat idea, and it’s probably a lot of fun when there’s a big crowd… but by the time I got there the crowd had largely dissipated. Luckily Dana and a few other stalwarts were still there cheering. Through the chute, a volunteer handed me my finishers’ hat and medal, plus one of those nifty Mylar blankets (a space spinoff, so definitely appropriate for the venue). I hung out in the arena to cheer on more finishers with Dana, the kids, and a few other finishers for half an hour or so, munching contentedly on a really excellent PB&J. When it was time to go, I hobbled over to the Fleet Feet booth to buy a finishers’ shirt, only to find that they’d sold out of my size the day before. This really, really pissed me off. I am still angry about it, in fact. I’d much rather have the cost of the shirt included in the registration fee, but, failing that, the race organizers at least should have bought enough shirts to ensure that all finishers would be able to buy them. Making them a scarce commodity is a terrible idea. After the race, I went home and relaxed for a while. I was pretty sore, but not debilitatingly so. I purposefully hadn’t planned anything for the rest of the day. Sunday morning I woke up with moderate stiffness in my quads and some tenderness in my left Achilles; by Monday those were both pretty much gone. I still get pain in my right instep when I put my running shoes on, so the short shakeout run I planned for after squats and deadlifts last night didn’t happen, but overall I am much less sore than I was after running my first half-marathon. In fairness, I was racing that one, while this time I was just running to finish. Pros: great race course, with excellent markings and signage. Free professional race photos. Superb volunteer support. Heavy police presence for traffic management. Clear and effective communications from RD team. Lots of aid stations and plenty of port-a-potties. Great support from the spirit teams. Cons: poor shirt inventory management; very limited food at aid stations. Overall, it was a great experience and I’m glad I did it. I’m happy to have RCM, my hometown event, be my first, and I am grateful for all the support, encouragement, and love from friends and family. I’m not in any real hurry to do another one though. And one of your #pathetic friends built that finish line you ran under (including the finish line chutes). LOL I’m not responsible for the clock though. LOL I DO have some ideas on how to resolve it though. I would have LOVED to have taken it down, but hard to do when runners were coming in pretty consistently. There were also two backup clocks (one per side) that were correct. Thanks for volunteering, Paul! I feel like a clock pinata session would be a great fundraiser for next year’s race.